Chance, yes honestly, there was a John Cage connection, uncovered this long-forgotten 3 LP set in my collection. The recordings from the French Forlane label date from 1981. 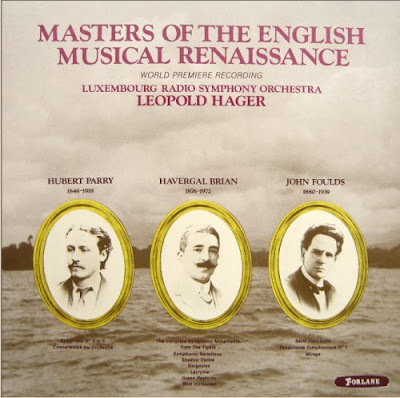 Three English composers from the early 20th century are featured, and the main works are John Foulds' Pasquinade Symphonique No 1, Hubert Parry's Symphony No 3 (The English), and Havergal Brian's complete Symphonic Movements from The Tigers. The sound on my LPs from the Luxembourg Radio Symphony Orchestra under Leopold Hager is surprisingly good, and the recording survives in the catalogue as 2 CDs. I'm not going to start all that nonsense about rediscovered masterpieces. But if English music of this period floats your boat this is worth worth exploring. These works are on a par with much of the orchestral music in the Naxos American Classics series. But the premium price is hardly an incentive to explore. Sir Adrian Boult recorded Parry's much superior Fifth Symphony. What is it about ... ? I should have mentioned the excellent notes with the LPs by Bernard Benoliel (who co-produced the recording) and Bruce Roberts. A review on Amazon.com suggests the notes have been transferred to the CD release. Bernard Benoliel (b. 1938) was educated in the United States, won a Bennington Composers Award in 1969 and a Tanglewood Fellowship in 1970. He moved to England the following year, where he divides his time between composing and his position as administrator of the Ralph Vaughan Williams Trust. I note from the notes that this English music project was controlled by Radio Luxembourg London. "... the first (Radio Luxembourg) regular broadcasts on 1.191 metres with a power of 150 kW and omnidirectional antenna went on air in January 1933... Every evening was devoted to a different country. From the outset, there were English evenings, French, German, Luxembourg, Belgian and Dutch evenings, and, less frequently, Italian, Swiss, Czech and Polish evenings. The formula was good because it was simple: very little talking, a lot of classical music with a good soloist every evening ..."
I wish BBC Radio 3 would take note of that last sentence.